Talents: Martial Arts B, C & E (karate), Military. Contacts: Dr. Gerro (Deceased), Android 17, Android 18, Capsule Corp. (Engineering, Aerospace, Physics, and Electronics, Am Resources), Z-Team (Hero Group, Rm Resources). 16 is a bio-mechanical construct. His body is composed of pseudo-skin/sinew and various cybernetic implants housed in an osmosium steel alloy endoskeleton (think of Vision from the Avengers). This means that he cannot reproduce like a Normal Human. True Invulnerability: Am(50). 16's bio-mechanical body gives him this power. Anatomical Separation: In(40). 16 can fire his hand units at a target in order to grapple or inflict a blunt attack of Am(50) rank and a range of 20 areas. The hand units are programmed to return and reconnect to 16's body. They move at a rate of 7 areas per turn. Laser Barrage: 16 can detach 1 or both of his hand units to reveal a laser cannon built into his forearms. These are set to fire bursts of lasers that do a total of 30 points of energy damage per arm. Each arm blast can affect up to 3 targets simultaneously and has a range of 15 areas. Combat Protocol: 16's combat system is programmed to counter the fighting techniques of Goku. When fighting Goku, 16 gets a +1CS to all his FEATs. His combat system also allows him to boost up his Strength +1CS for 1-5 turns. 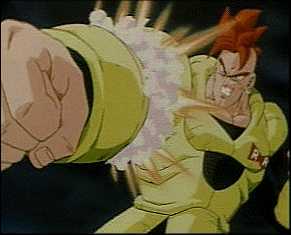 Self-Destruct Mechanism (Removed): As a failsafe for his most powerful androids, Dr. Gero installed a high yield nuclear explosive within each one (with the exception of Cell). The explosive inside 16 could do up to SX(150) damage to everything within a 5 area range radius and -1CS damage per every 5 areas beyond. Note: 16's programming was incomplete when he was activated. This gives him a +2CS to resisting his combat protocol priority of destroying Goku. 16 is also 1 of Dr. Gerro's modular prototypes. 16 was posthumously made an honorary member of the Z-Team. After Goku, Bulma, and Krillin(as teens) destroyed the remnants of the Red Ribbon Army, the Army's leader, Dr. Gerro decided to build super-powered androids. Each android would have the might of a small army. Dr. Gerro took the last survivors of the army and transferred their minds into waiting Android bodies. He then erased most of their memories and implanted false ones to control his creations. As added insurance, the Dr. built a shutdown remote switch that can deactivate the androids if they rebelled. Dr. Gerro then transferred his own mind into an android body. Unfortunately for Dr. Gerro, his memory erasures of 17 and 18 were not complete. The brother and sister androids rebelled and were subsequently deactivated by Gerro. After Gerro was defeated by the Z-Team he fled to his secret mountain lab and reactivated 17 and 18. Thinking they would help him fight the Z-Team, Gerro understimated the siblings' rebellious nature. As a result, the Dr. and his remote control were destroyed by the androids. The android siblings then activated 16. Consequently, the Z-Team and the time-traveling teen Trunks confronted the androids only to be soundly defeated. Prince Vegeta and Trunks were badly beaten by 18 while 17 nearly killed both Piccolo and Tien. Krillin could only watch in fear as the very androids that future Trunks warned the Z-Team about were revealed. It was at this point that 18 met Krillin(who fell in love with her). Bulma then sent a distress message to the Avengers only to find that they were on an off-world mission and would not return for 2 weeks. The Z-Team was on their own. 17 and 18 then activated 16 who was specifically designed to destroy Goku. The trio roamed the countryside in search of Goku, but were unaware that they were being hunted by the bio-organic android known as Cell. In time the androids were confronted by the Super-Namek named Kamicollo. 17 and the Namek fought to a stalemate and were exhausted when Cell ambushed them. Cell mortally wounded Kamicollo and attempted to absorb 17. 16 intervened and tore off Cell's tail. It was at this time that Krillin arrived with a deactivation remote control that Bulma had built using Dr. Gerro's blue prints. Krillin was spotted by 18. Seeing the fear and dread in her eyes at being permanently deactivated, Krillin destroyed the remote. Unfortunately, 16 had not counted on Cell's regenerative capabilities. Cell had regrown his tail and then absorbed 17. The resultant evolutiion of the organic android made him more powerful than 16. After a brief battle, Cell had severly damaged 16. Realizing the secret of Cell's power, 16 and 18 fled to islands in the Pacific. In the meantime, Tien intercepted the pursuing Cell. Tien used his gravity-effect powers to their limits and fell unconscious. Before Cell could finish the mystic mutant off, Goku teleported to Tien's side and rescued both Tien and Kamicollo by teleporting with them back to Kami's Look-out. After finishing their training in the hyperbolic-time chamber, Vegeta and Trunks(alternate future) intercepted Cell. As a show of power, Prince Vegeta used his Ability Shift to give himself the brute strength he needed to defeat the organic android. After less than 10 minutes of fighting, Cell realized that he could not defeat the Saiyan prince unless he absorbed 18 to evolve to his final form. Using Vegeta's pride to his advantage, Cell convinced the prince to allow him to absorb 18. In his arrogance, Vegeta agreed. Enraged at his father's decision, Trunks attacked Vegeta. This distraction allowed Cell to absorb 18 and evolve to his Perfect form. Trunks and Cell then fought with the result of Cell as the winner. The heavily damaged 16 asked Krillin to take him to someone who could repair him so that he could help the Z-Team fight Cell. Krillin took him to Capsule Corp. where Bulma and her father Dr. Briefs examined the android. During their repairs, the robotics lab's scanners detected the nuclear failsafe device inside 16. Unkowingly to 16, Dr. Briefs promptly removed and dismantled the device. 11 days later, the Cell games began. These games were really a tournament that was to decide the fate of Earth. Cell had successfully beaten Goku and was currently battling Gohan. Seeing that the only 2 beings present that can defeat Cell were nearly down for the count, 16 sped up to Cell and grabbed him in a bearhug. 16 revealed that he had just armed his fail-safe system and that only he and Cell would be completely vaporized. Unfortunately, Krillin revealed the truth of the fail-safe. Enraged at being blindsided, Cell used his powers to disintegrate all but 16's head which bounced to the floor of the destroyed battle arena. The head rolled to a stop at Hercule's feet. By sheer force of will, 16 had managed to reroute what remaining energy he had to his CPU systems in his head. 16 then convinced Hercule to throw him towards Gohan. It was then that 16 pleaded with the young half-Saiyan to let his power and anger loose for the sake of the planet and all life on it. Consequently, Cell put an end to 16 by destroying his head and CPU. This final act of self sacrifice by 16 and cruelty by Cell caused Gohan's mental blocks to come down. An angered Gohan(now SS2) used his Disruption powers to humiliate Cell. The attack caused Cell's body to expel 18 and revert to his semi-Perfect form. 1 hour later the threat of Cell was ended forever(hopefully). The Z-Team then mourned the losses of both Goku and the noble 16.